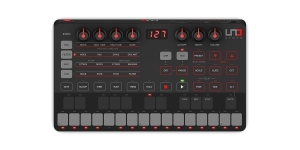 Synthesizer, Hybrid, Digital+Analog, Voices: 4, Paraphonic, Monotimbral, Mini Keys, Size: 2, Number of Keys: 25, Production start: 2019. Synthesizer, Analogue (A), Monophonic, Monotimbral, Oscillators overall: 2, Oscillators per voice: 2, Production start: 2018. Production start: 1983, Production ended: Yes. Digital (D), Production start: 1984. Digital (D), Production start: 1985.